… to download a copy. This is big and may be slow so I suggest saving the PDF on your own computer’s drive or to a cloud server. You can print the 118 pages. You can search this document using Chrome, Microsoft’s New Edge browser, etc. I was not able to put the document into Kindle because of its size. Amazon will only load PDF files that are smaller than 50 MB and Critical Summary clocks in at 106 MB. What you can do is print the first 40 pages as a PDF, the second 40, and then the rest of the document. Give different names to each segment and then send them off to Kindle services at Amazon. Think of it as a book in three volumes. I was, however, able to upload Critical Summary to Google Drive. This means I can read it on an iPad at Starbucks. Google Drive is pretty fast. I was able to upload the whole document in less than three minutes and subsequently open the document on my iPad in less than a minute. One thing you cannot do (by authors’ choice) is copy and paste. This is just plain silly. I use Microsoft Notebook to get around this taboo-like limitation against fair use quoting: how not to win friends and not influence people. The purpose of the Critical Summary is to provide a synthesis of the Turin Shroud Center of Colorado ([SC) thinking about the Shroud of Turin and to make that synthesis available to the serious inquirer. Our evaluation of scientific, medical forensic and historical hypotheses presented here is based on TSC’s internal research, Shroud of Turin Research Project (STURP) data, and other published research. The Critical Summary synthesis is not intended to present new research findings. With the exception of our comments all information presented has been published elsewhere, and we have endeavored to provide references for all included data. The ratings given to data items presented in the empirical data sections of the Critical Summary are based on TSC’s judgment of what constitutes class 1, Class 2 and Class 3 evidence, as explained in the Introduction. We wish to gratefully acknowledge the contributions of several persons and organizations. First, we would like to acknowledge Dan Spicer, PhD in Physics, and Dave Fornof for their contributions in the construction of Version 1.0 of the Critical Summary. We are grateful to Mary Ann Siefker and Mary Snapp for proofreading efforts. We also are very grateful to Barrie Schwortz (Shroud.com) and the STERA organization for their permission to include photographs from their database of STURP Shroud photographs. Barrie served as a lead photographer during the STURP expedition to Turin to study the Shroud and today is recognized worldwide as the founder and administrator of the important Shroud research repository site http://www.shroud.com. All Shroud photographs are ©1978 STERA Inc. unless otherwise noted. We welcome comments, but we can only consider those that are substantive and that are emailed directly to our website (via the Shroud Data tab). Oh, and yes. The punch card chart aiming to be scientific analysis showing that John Jackson’s fall through hypothesis is the only workable hypothesis is still in Version 3.0 (on page 73). Ridiculous. More on that later. The authors want comments but only those “that are substantive and that are emailed directly to [their] website.” I, on the other hand, think that open no-holds-barred discussion is the only way to go. We’ll do that. One thing you cannot do (by authors’ choice) is copy and paste. This is just plain silly. Ubuntu Linux, and secure formats pdfs are broken. 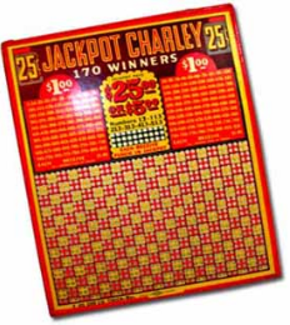 Dan, the “punch card chart” is not aimed at being “scientific” analysis. As clearly stated at the top of the chart with the word “judged”, this is TSC’s analysis. We have included only 17 image characteristics because we think that these seventeen, in and of themselves, can be used to evaluate image formation hypotheses that have gained at least some traction through the years. The chart itself does not stand alone. Appendix 1 gives our reasoning for each mark. Again it is judgment and if the image characteristics are indeed true, as we judge them to be, understandable to anyone. We also state that the The fall-through hypothesis cannot be tested or proven. In fact it is a very “unscientific” explanation as we acknowledge in its description and in the Conclusion. It just fits the data. Read it. Think about it in the context of the whole body of Shroud evidence. As clearly stated at the top of the chart with the word “judged”, this is TSC’s analysis. We have included only 17 image characteristics because we think that these seventeen, in and of themselves, can be used to evaluate image formation hypotheses that have gained at least some traction through the years. The chart itself does not stand alone. Appendix 1 gives our reasoning for each mark. Again it is judgment and if the image characteristics are indeed true, as we judge them to be, understandable to anyone. We also state that the The fall-through hypothesis cannot be tested or proven. In fact it is a very “unscientific” explanation as we acknowledge in its description and in the Conclusion. It just fits the data. Read it. Think about it in the context of the whole body of Shroud evidence. Think about it in the context of the whole body of Shroud evidence? corresponding to the direction of gravity. There is no vertical projection in general.. And the hair is matted to the sides of the head. It’s a shame that this blog is not read more carefully. Although it is full of opinions and discussion, from time to time something appears which is easy to check and which refutes previous arguments. For instance, pages 16/17 of this paper is devoted to a comparison of the Enrie negative with a Justinian solidus, with special attention being paid to “a subtle double fold in the cloth just below the neck”. It is easy to check that this fold, subtle or not in the Enrie photo, simply isn’t present in the Pia photo, and was therefore an artefact acquired between 1898 and 1931. Any resemblance to a Byzantine coin is entirely coincidental. 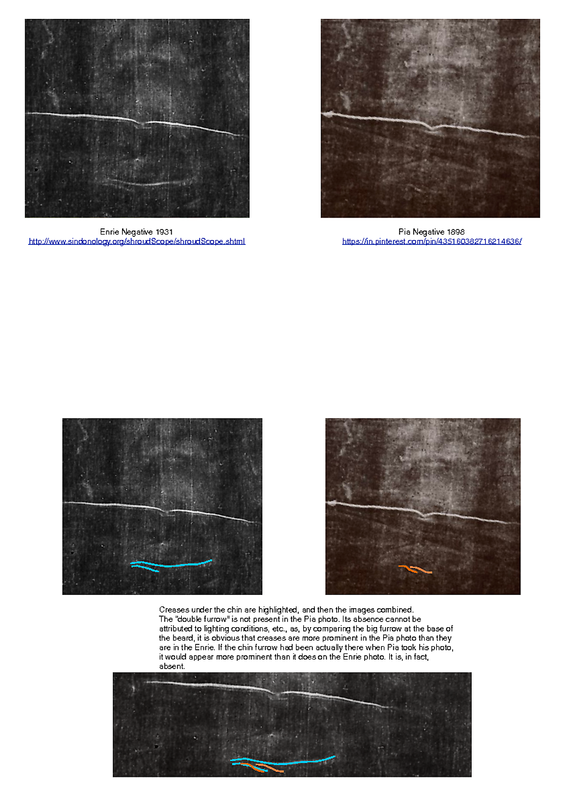 I have just put the two negatives side-by-side, the Enrie photo from Shroud Scope, and the Pia negative from the Musée de l’Élysée, Lausanne – there is a clear match of the Enrie markings found below the throat, with the Pia negative in the same location. It SIMPLY IS PRESENT in the Pia photo, and any fair-minded person with normal eyesight can see it. But, there is none so blind as he who will not see…. Dan: please post the photos side-by-side…. Not really confident about how to post a picture here, but you can go this website and see the 2 negatives side by side….. This might be one of those ‘I see it, you don’t’ challenges. To say the neck line is absolutely in the Pia is wishful thinking. But to say that it definitely isn’t, is likewise wishful. There’s something there and dismissing it as a trick of the lighting is weak. But here’s my question. The artist that struck the Byzantine coin, if he’s modeling from the Shroud, could he really pick up that neck line? He wasn’t looking at a negative either. I lean toward a coincidence here, albeit a strong one. I can see why people make the connection. David, I wouldn’t say trick of the lighting, I would say that you can’t dismiss lighting conditions, as Hugh did. Lighting: On the Pia photo, the large crease (running across the beard) has a prominent “gleam” on the left end which the Enrie photo doesn’t have. Also, when both are magnified further, that Pia “large crease” meanders and curves its way across the neck, while the Enrie “large crease” is much more straight, which might mean the Shroud was hanging differently during the 1898 and 1931 sessions. The real question is, what did the coin-minters see on the Shroud positive image and how dark was it then? Obviously they were not allowed to see the whole object, because if they had detected it was a burial shroud, they would have known that Jesus would have been naked. Just what the two lines on a naked body really were has been the subject of several papers. 589-711AD in Spain – Peter ran to the tomb with John and saw the recent imprints of dead and risen One on the clothes. Yet in 1203 painters placed Nail Marks on the Palm and not on the wrist..
(about Radiations […and then: What kind of radiations? …IR, UV, VUV or … what?]). “Blood on the Shroud of Turin: Part III. from blood streams on the Face. the idea “that image was formed due to Radiation”. chemical analysis of the Shroud. more correct when we write. Is that remark a “toxic input” for your brain? No other image formation model explains EVERY observation. Now to figure out what the matter was doing during image formation to render such a beautiful record of the entire Gospel. What form of energy, UV and soft Xrays from electrons collapsing into the nuclei perhaps? That sounds like a new force or the unified force, a new physics and I like it. DG wrote: “This might be one of those ‘I see it, you don’t’ challenges. To say the neck line is absolutely in the Pia is wishful thinking. But to say that it definitely isn’t, is likewise wishful. There’s something there and dismissing it as a trick of the lighting is weak. I agree-is it the same? No. But there’s something there. To dismiss it completely seems a bit of a Farey tale. There are other places in both images that aren’t exactly the same either-there are also regions that are similar in both. Depends on where you look. The major crease isn’t entirely superimposable in both images-it’s a little more diffuse, little more wavy in Pia’s. It is valid to assume the cloth was hung/displayed in exactly the same precise manner both times? A slight bit of stretching at this region or not being completely flat could influence the appearance in a photo. The photos do indeed have a slight difference of orientation, and cannot be directly superimposed, but attempting to claim that a crease which clearly isn’t there actually might be is grasping at straws. The crease above the disputed one is clearly identifiable in both photos, as is the one across the top of the head. What’s more, these creases are quite clearly more pronounced in the Pia photo than on the Enrie. The reason for this is evident both by looking at the Pia photo closely, and also by noticing the the Pia photo is slightly wider with respect to its length than the Enrie. It is because Pia’s Shroud is visibly quite badly wrinkled all over, while Enrie’s has been brushed, pulled or stretched slightly to remove all those minor wrinkles. In spite of that, a new crease is boldly evident in 1931 that is not evident in 1898. ‘Clearly isn’t’…in your opinion. I’m not so convinced. Perhaps the line is clearer in Enrie because it has been flattened, exposing the crease. Try it with an pair of old jeans, you’ll see this effect. “which clearly isn’t there”….according to Hugh’s prejudice. Said as a fact, when it CLEARLY is an opinion that varies among different contributors to this site. He must be a lot of fun in the classroom…. Of course, you are talking about the same sort of folks who dismiss the “Four Holes in an L-shape” pattern on the Pray Codex illustration of 1192 AD as either a coincidence or that it represents some sort of architecture pattern…..
That is the one they really would die for, in defense of their skepticism, because they go to embarrassingly extreme lengths to fantasize an answer. 1192 being outside of the possible range of their “precious” C-14 dating, don’t you know….. I believe Hugh has commented before that the 4 holes are enigmatic. He’s proposed alternate theories which I wouldn’t exactly call fantasies. Obviously a skeptic is going to present counter arguments/observations. The same way an authentist does when confronted with evidence that weighs against authenticity. He did come across as bit more dogmatic on this topic than I am used to seeing. But he’s obviously convinced on this matter, so I’d expect him to sound convinced. Then inexactly call them fantasies. Either way…. I guess it’s more subjective than I thought. The Pia negative is criss-crossed with creases all of which have been smoothed out by the time Enrie took his. The two most prominent creases in the Pia negative have been considerably weakened by the smoothing process. How curious that a crease previously invisible has been suddenly clarified. Doesn’t work with me, but I do appreciate that others have a different view. And yes, I’m a lot of fun in a classroom! The Solidus coin entry in the Critical Summary is very interesting. Reading the reference to Giulio Fanti’s, et al’s work on research in this area is important. There is a full length chapter in his new book on the topic. Well worth the read. Certainly one may well justifiably judge the evidence of the Solidus coin as coincidence, or not even that strongly. It can in fact be justifiably judged to have not significant at all to the question of the provenience of the Shroud. The bigger issue however is context. If for instance, like Dan, you judge the Pray Manuscript to “probably” not be a coincidence then that judgment throws light on other items of evidence. This is why context is just as important as drilling down with an all or nothing focus on a singular item of evidence. Just one judgment of “probably” (or stronger) on one item in a long chain of pre 1204 Shroud evidence changes one’s entire perspective. Now everything pre 1204 is looked at differently including a justified judgment that the Solidus coin isn’t just coincidence.